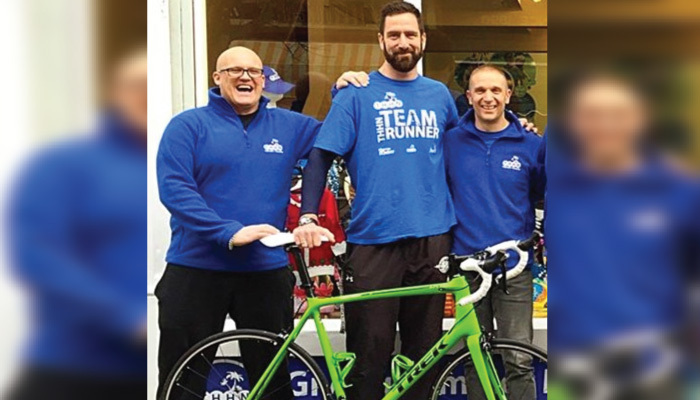 It’s all go for THHN – the Memory Maker Shop is going great guns, plans for our City to Sea Ultra Marathon and Music Marathon are coming on apace and fabulous THHN volunteers are doing wonderful things to raise money for us. So,here’s the latest round-up of all our news…..
By the way, on the subject of Glen, his fundraising evening at Pier Point last month raised over £3000 for us. Unbelievable. Over 60 THHN volunteers helped out on Friday 3 April as we helped pack bags at 15 checkouts at Sainsbury’s Torquay. A fantastic £1832.10 was raised in total. For us, it really was a Good Friday (see what we did there?) Thank you to each and every one of you, to Sainsbury’s for inviting us and and to everyone who let us “help” with their shopping! You all know about our City to Sea 53 Ultra Marathon and 23 mile run/walk. Well, we’ve now added a couple of new categories to the event. You can enter as a relay team and we’ve also now opened the walking event to under 18s too. For more information check out the website at www.cts53.co.uk. As part of our celebrations on Saturday 5 September, we have our Race Village up on Babbacombe Downs. As well as housing the finish line this will be home to all sorts of entertainment and fun goings-on including our Music Marathon Marquee from where we will bring you 9 hours of great live music so do make sure the date is in your diary. If anyone would like to get involved sponsoring this amazing new event please get in touch. Sponsors signed up so far include: Hanbury’s Famous Fish & Chips, Babbacombe Garage, Caterfood and the Pavey Group. We have some lovely new Memory Maker wristbands. Available to buy from our Memory Maker Shop in St Marychurch Precinct, as well as St Marychurch Sainsbury’s they cost just £1 to buy. They’re bright and cheerful, they help make money for us, they spread the word about us and they show that you support us. We love them. If you have a business and would be happy to sell them for us, we’d be delighted to hear from you. Thank you. Team THHN was out in force at the Plymouth Half Marathon, on a warm sunny day expereicned and first time Half Marathoners took to the course to fly the flag and raise some funds for THHN. A big thank you to all who entered and the volunteers who helped on the day. A big well done to Team THHN runners Geoff Pring and Andrea Kingdon who ran the London Marathon and raised funds for THHN. They both enjoyed the day acheieved great finishing times. Geoff has so far raised over £2,900 and Andrea has raised £600, which are both fantastic amounts to raise for THHN and will help us help families affected by serious illness and bereavement have some memory making holidays. Torbay Half Marathon – Sunday 28th June www.torbayhalfmarathon.co.uk Don’t forget, we have places available if you’d like to be part of Team THHN at this event. Simply e-mail brian@thhn.co.uk. Everyone involved in our Memory Maker caravan which last month was holiday home to three different families referred by the Birmingham CLIC Sargent team as well as a family referred by the Exeter CLIC Sargent team. Westcountry Fruit Sales, Hallets the Bakers, Torbay Family Butchers Ltd, Claire’s Cakes, Riverford Home Delivery, Save on Meats Torbay, Kayleigh’s Kreations and D&H Fishmongers for all the delicious goodies they supply for our holiday families. Teddy Mountain and Vain Train who donated toys as gifts for our visiting children. The Marine Hotel in Paignton who welcomed a family from the Rainbow Trust Children’s Charity. Our Holiday Liaison Officers, John and Angela Bunce, who own Vomero Holiday Apartments and who welcomed a family referred by the Lifetime Service in Bath. Kayleigh’s Kreations who made and sold some absolutely scrumptious cup cakes to raise money for us. Lovely. Mark and Jacky of Blackadon Barn Cottages in Ivybridge who welcomed their very first THHN family last month. The family were referred by Rainbows Hospice for Children. Thank you so much for joining our network. Everyone at Flow Physio and Pilates who raised £136 for us by holding a cake sale and raffle. Great stuff. The charity committee at Britannia Royal Naval College in Dartmouth who presented Luke with a cheque for £500 recently. What a great place to visit and a lovely donation to receive. All the champion children who took part in our Christmas Card design competition. Winners were 6 year old Archie Tucker from All Saints Babbacombe Primary School in Torquay, 8 year old Taylor Jane Weaving from Oldway Primary School in Paignton, 10 year old Millie Etherington from Homelands Primary School in Torquay and 11 year old Jacob Thomas from St Margaret’s Academy in Torquay. The winners each won a £40 Toys “R” Us voucher, very kindly sponsored by our good friends at Teddy Mountain. As well as that all the winners and runners up had a class visit to see all our little friends at Babbacombe Model Village. On the subject of Christmas, we also have to thank our friends at Dartmoor Christmas Trees who very kindly made a donation to THHN for every Christmas tree they sold last year and we were delighted to accept a cheque from Jennie Kirkup for a fantastic £400. There are a selection of Geopark Adventure events planned for this year doing all sorts of exciting things and we are lucky enough to have some Team THHN places available if you’d like to give them a go. How about trying your hand at one of these?